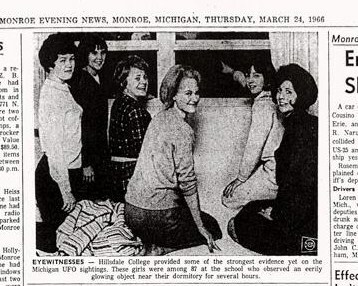 The other day I recounted the tale of Gidget and Pinky, two college coeds who witnessed a UFO out of the windows of their dormitory at Hillsdale College in Michigan and became part of one of the biggest mass UFO sightings in U.S. history. I loved their story because they had such perfect, perky little college coed names (for 1966, anyway, which is when this all took place), and because Gidget's write-up of the experience in the Hillsdale Collegiate college newspaper was so sparkly and zippy and, yes, precise that I couldn't stop reading it. Because it's going to be such a significant part of my book about Dr. J. Allen Hynek, I've continued to research the Hillsdale sighting, and I must now report that I have made a terrible, horrible discovery. It turns out 'Gidget' and 'Pinky' weren't their real names. 'Gidget Kohn' was actually Barbara Kohn, 21, from New Castle, PA, and 'Pinky Poffenberger' was actually Cynthia Poffenberger, 18, of Cleveland, OH. How they were able to attend college and submit a UFO report under assumed names is beyond me, but I am deeply disappointed by the whole thing. "Barbara & Cynthia See a UFO" has no life, no zing. People named Barbara and Cynthia report seeing UFOs all the time, and they're usually lying. There is another update to this story as well. Today I received a comment from a reader that said, "The people in Michigan saw more than lights in the sky. Police officers near Chelsea/Ann Arbor saw a craft with a 'quilted' surface. Some cops saw it up close. For a time it had landed. The Air Force tried to debunk all of this." It is true that the Air Force tried to debunk all of this, as the reader states. J. Allen Hynek, who was then still employed by the Air Force on Project Blue Book, infamously pronounced to the press that the Michigan UFOs were possibly swamp gas. But the rest of the reader's comment, I have found, is not strictly true.